One of the experiences I feel is ubiquitous to being a nerd is playing a spot of Dungeons and Dragons. Friends gathered around a table surrounded by junk food, fingers rubbing nervously at multicolored die, and all trained on trying to figure out how to get their characters out of the jam they’re in. That’s what DnD should be. My first experience was 2 hours of creating a character sheet, bumbling through spot checks, and having far less fun than it sounded. I had been put off of the DnD idea for a while, but knew I wanted to try it again. Then along came Card Hunter, a game that blended traditional tabletop gaming, card game mechanics, and charming yet simple storytelling. Could this really be the answer I’d been looking for? 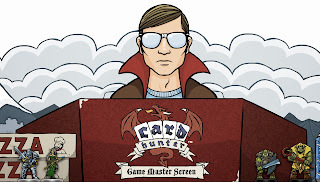 One look at the visual style and overall vibe of Card Hunter and it’s difficult to not fall in love. You’re a new tabletop gamer with an inexperienced GM named Gary leading your story. As you and Gary bumble your way through your first campaigns, his brother Melvin is always watching over him and making him question his every move. And this story isn’t even part of the narrative. Card Hunter take the approach that if you’re playing a tabletop game, it should look like one, feel like one, and the scenarios are crafted around you playing this game. The story within the tabletop game is forgettable at best, but you yearn for the next quick quip from Melvin or mistake from Gary. It’s an interesting mechanic and one unique to this title. The gameplay is part DnD, part Kingdom Hearts: Chain of Memories, with movement being dictated by tiles, but actions being dictated by randomly drawn cards. These cards determine how far you can move, your attacks, and your defense. It’s an interesting system I haven’t seen in a video game before, but it’s not difficult to understand. The cards in your inventory are determined by the items you have equipped to your characters, meaning you don’t have the fine granularity of card games like Magic the Gathering at your disposal. Maybe a weapon has two very strong blows, but three minor ones and a negative status effect, you can’t just pick and choose what you want. This aspect brings a new level of strategy to deck building that isn’t lost on me even if I’ve played very few card games. The visual style looks exactly like a tabletop in a friend’s basement—a flat map with standees on top. This choice is a smart one and falls in line with the game’s hyperawareness that this is a game about playing a game. In a strange sense, seeing your characters represented by flat pieces of cardboard gives them much more charm. Over the years, we’ve seen characters go from cartoony to realistic, from pixelated to high def, and from 1 dimensional to 3 dimensional. I’ve seen very few games throw all that to the wind for a static, flat, unanimated look and they’ve mostly been terrible. Somehow, Card Hunter not only pulls it off, it makes me wish I could see more like it. 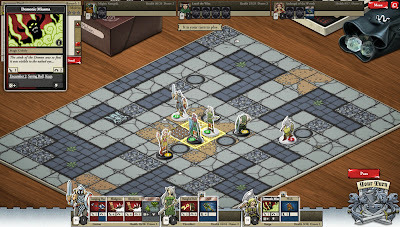 Card Hunter is a free to play, browser-based game and like most in its category, the developers are paid through in-game purchases. It’s possible to go through the game without ever paying a cent, though it gets harder to do so as you increase in level. If you do choose to purchase access to the Card Hunter Club, you get an extra item for every dungeon you loot. You can also purchase the game’s monetary currency, pizza, in order to buy more dungeons to raid. They even incorporate buying pizza into the story as Gary has a huge crush on the pizza girl Karen. Seeing these interactions is a treat and it’s nice to see the developers integrating the metastory into monetary purchases, as it makes the experience seem more natural and less disjointed. The game also features a fun multiplayer aspect after level 5 in which your multiplayer party (separate from your single player party, though I’m not sure why) can go face to face with opponents of similar level. The formats are roughly the same as the single player adventures, though the maps are generally smaller and control points are more important. Overall, it’s a nice addition to an already entertaining game. 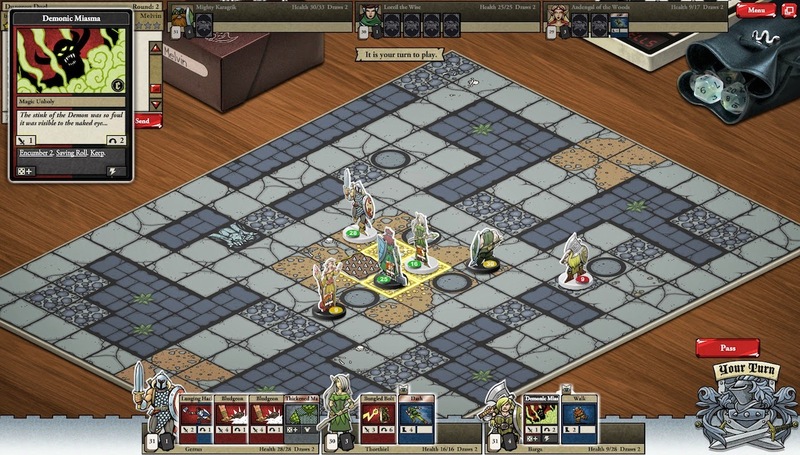 Verdict: Card Hunter deserves your attention, and not just because it’s free either. The gameplay is addictively fun, the metastory, though sparse, is funny enough that you want to hear more, and the deckbuilding and combat both make the game a must try. Even if you don’t like strategy games (and trust me, I’m with you), this is still something you should try. And why wouldn’t you, it’s free. So grab some Cheetos and your preferred carbonated beverage, pull up a folding chair, breath in the musty scent of old card table and well-worn manuals, and immerse yourself in Card Hunter.